The idea and inspiration for this article come out since after about a month ago I started to invest both in cloud mining and building my very own GPU mining rig. 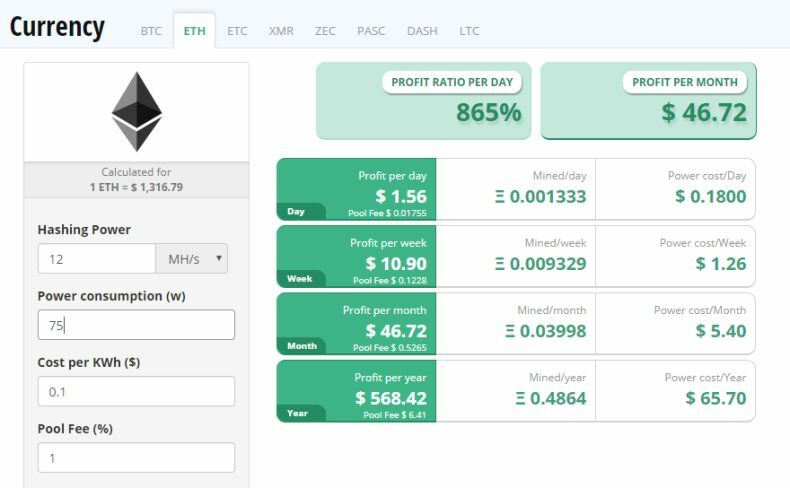 I decided to compare - what's more profitable - doing all by yourself or just throwing money into cloud mining contracts. 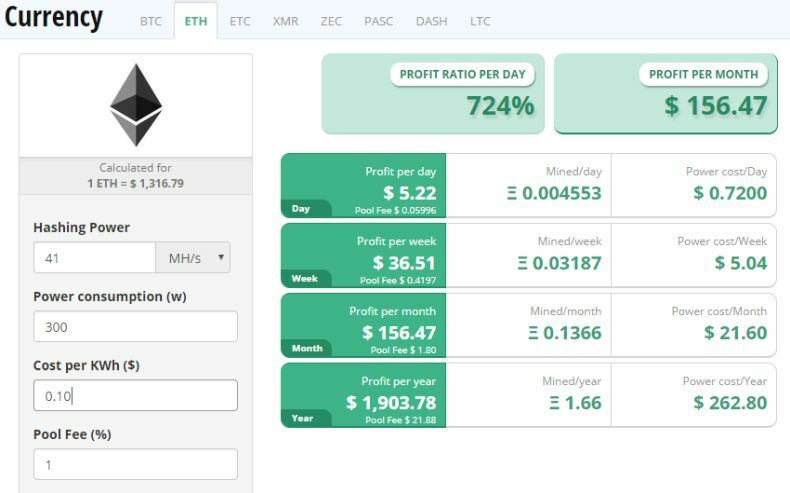 With Rising Ethereum Price I'm making $5.22 daily by Mining Cryptos - And I Definitely Want MORE! Shortly before the Christmas time I decided to experiment with cloud mining contracts and opted for Bitcoin Cloud Mining contract from Hashflare.io - again the same approach - dollar cost averaging, and investing small once per month in additional hashing power. Now, for the ease of this experiment - let's compare Ethereum mining - DIY and Cloud contract from Hashflare.io. Also, I will assume you already have basic components - like motherboard, pc risers, processor and so on - and the one and only investment you are concerned is - adding a new graphics card. As of writing this, with ETH priced at $1,316.79 - I would make a profit of $1.56 daily, $10.90 weekly, $46.72 monthly and $568.42 yearly. Let's stick with the yearly data, power cost per year would be $65.70. Also, I would mine about 0.4864 ETH after one year. ROI for my $220 investment would be about 141 days or little less than 5 months. Now, let's do the math for Hashflare ethereum cloud mining contract, with initial $220 investment we could buy exactly 10MH/s mining contract for one year. That's already 2MH/s less if we would opt to buy GPU card. Now, I don't have actual experience buying Ethereum cloud mining contracts on Hashflare, as I have just tried BTC cloud contracts, but reading FAQ I learned that Ethereum contracts are not subject to any fees, which is Awesome. You get what you paid for. Frankly speaking, this sounds too good to be true - Ethereum Cloud mining contract from Hashflare would perform just slightly worse than your own existing mining rig. I wouldn't say this is a red alarm for me, but it still raises some questions - how comes? Is Hashflare legit and so on? Please, be extra careful when investing in cloud contracts or cryptocurrency, these are super risky investments - never invest more you can afford to lose. Now, the total amount I've invested so far in my GPU mining rig is $1,365 - and currently, it gives me a hashing power of 41 MH/s. Again I haven't yet calculated precise electricity consumption, but for the sake of this experiment, let's assume it's 300 Watts. Currently, I'm making a profit of $5.22 daily, $36.51 weekly, $156.47 monthly and $1,903.78 yearly. Let's stick with the yearly data, power cost per year would be $262.80. Also, I would mine about 1.66 ETH after one year or operations. ROI for my $1,365 investment would be about 261 days or little less than 9 months. We could get about 62 MH/s hashing power for one year. WOW, isn't that sweet? Theoretically, just by throwing money into Hashflare Ethereum cloud mining contract I would make way more than building my own mining rig. 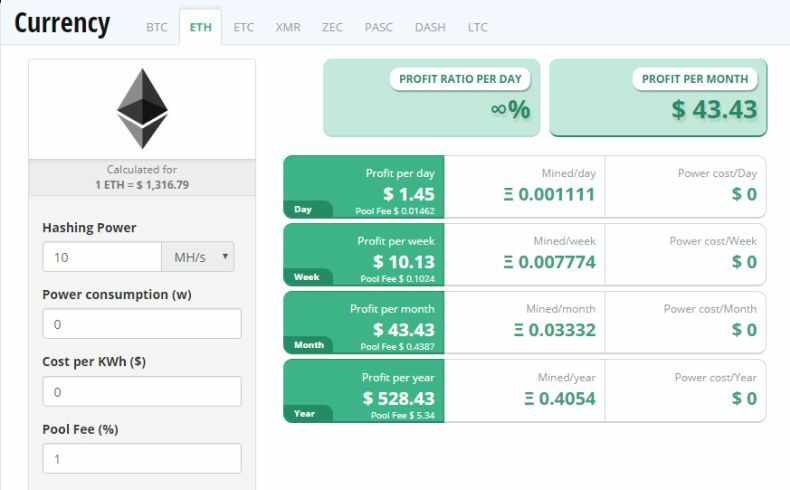 The same money I've put into GPU mining rig, if invested in Hasfhlare, would make a profit of $8.98 daily, $62.83 weekly, $269.29 monthly and $3,276.29 yearly. Also, I would mine about 2.51 ETH after one year or operations. Ethereum contracts are not subject to any fees. ETHASH, EQUIHASH and DASH contracts last for 1 year (365 days) and are not subject to any fees. minimal ETH withdrawal is 0.1006 ETH, where 0.0006 ETH (in GAS equivalent) is paid to blockchain. Sounds good? Take a deep breath before hitting magical buy hash power button from HashFlare. There is a great chance of Ethereum mining network switching from Proof of Work to Proof of Stake, which puts a lot of miners in very uncertain future. Including me. Being tied to cloud mining contract you would be dependent on the mercy of cloud contract issuer, instead of having your own mining rig where you are in a full control and can switch to other profitable minable coins after a possible Ethereum POS. Hello Reinis and thanks for sharing your experience. I just bought a 2 years contract with 162 MHs power of ethereum for around 4500 dollars (maintenance fee included) from a cloud mining Swiss company. I'm expecting a ROI around 160% based on current price and future difficulty. But im not comfortable with this thing about the proof of stake coming next year. Will this new algorithm implementation be a problem for miners? How can this be a problem? What do you have to say? Bad decision? Thanks for sharing your experience buying a cloud contract. Indeed planned POS makes a lot of uncertainty for 2018. I believe you should check with your cloud mining company what will they do in case of POS. A refund or more probably switch to another profitable coin to mine? From what I have read on hashflare - in case of POS they will switch ethereum cloud contracts to other coin. Now, let me remind you one more time - Please, be extra careful when investing in cloud contracts or cryptocurrency, these are super risky investments - never invest more you can afford to lose. In conclusion - cloud mining contracts will suite for people not willing to take the technical risk, upkeeping, learning and more - cloud contracts kind of gives the feeling - throw a money and watch it grow. On the other hand, you must do your homework and research before putting a significant amount of money into cloud mining contracts, there are a lot of scam and ponzi schemes out there. Please note - I'm not a financial advisor, services mentioned in this article use at your own risk and remember your capital is at risk, you could lose some or all of your money. Make sure to subscribe below for e-mail newsletter or enable push notifications to receive latest updates on how does it goes! 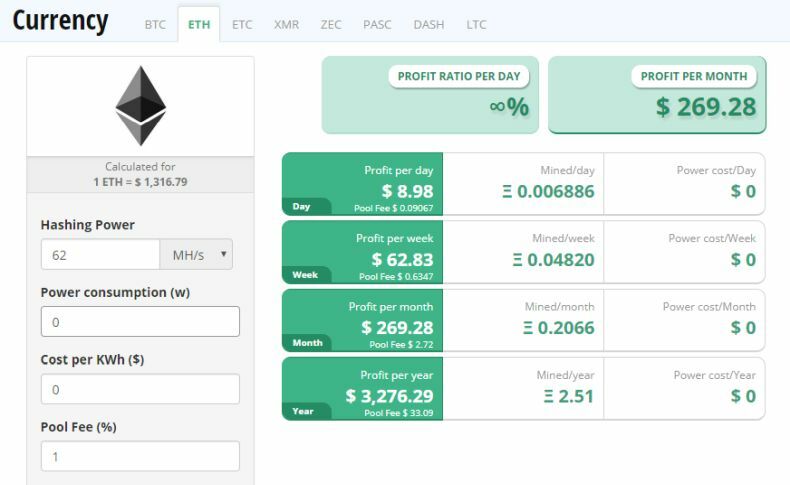 Is It Profitable Mining Ethereum (ETH) now (August / September 2018)?